It started out as a bit of an off the wall idea last year: find a piano and place it on Wellington’s waterfront for anyone who fancied knocking out a tune could do so. That fancy is now a reality thanks to a kind donor, a helpful cafe proprietor, and some members of the Rotary Club of Port Nicholson, Wellington, NZ. accompanied by Cindy Muggeridge on piano. Wellington Waterfront Ltd, the City Council owned company that manages facilities in Wellington’s inner harbour, asked the club to find a piano and locate it on the waterfront so passers-by could play a tune or busk some time away. 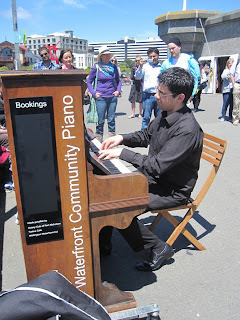 Locating pianos like that is common overseas, and it was certainly agreed that a piano would add to the colour and vibrancy of Wellington's magnificent waterfront which attracts hundreds of walkers, runners and lunchtime amblers every day. What seemed difficult at the outset became a reality with a little thought and imagination. The family of Eileen Stratchan kindly donated a piano because they liked the idea of having a piano on the waterfront for all to use. Port Nicholson Rotarians put it on a set of castor wheels. The Tuatua Cafe on the waterfront agreed to look after the piano, and on fine days it’s wheeled out for anyone to use – concertos to chop sticks, blues to bourees, Gershwin to Rimsky-Korsakov. The Wellington Community Piano was officially opened in November 2012 by Ray Ahipene-Mercer, a local city councillor. Early admirers included Prince Charles and Camilla, Duchess of Cornwall. On an official waterfront walkabout on the Prince’s 64th birthday, they were treated to a royal rendition of “Happy Birthday”. The piano also got Rotary onto the TV One Breakfast show. The project cost very little and it was a win for all involved. It highlights how some creative thought goes a long way. Rotary Community Corps ... in NZ communities? Angel Flight NZ has taken off!